There are folks that like to find antiques for their house. There are others like like more of a vintage retro look. Either way, there can be a lot of time spent finding the original items. Restoration Hardware offers new versions of many items that share the look and feel of yesteryear quality but for modern times. Most often we think of them for bedroom and dining room items. Recently, they have added a few items for the iPad! First, iPad cases. made from Artisan Leather. 6 colors are available, with/without a bluetooth keyboard. These aren’t for someone looking for light weight thin protection. The Restoration Hardware iPad cases are about quality, both in look and feel. They are the difference between walking into the office with a messenger bag versus a lawyer’s book bag. If you want something you wont see elsewhere, how about a ‘Gramophone‘. 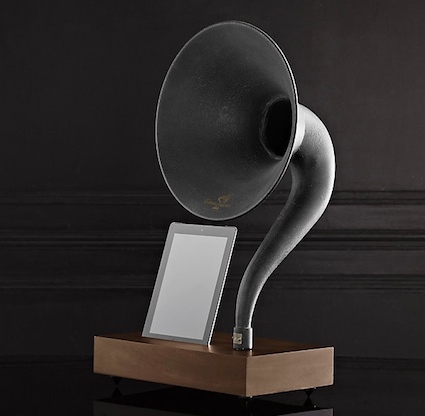 Taking from the Thomas Edison 1800’s phonograph, the Restoration Hardware Gramophone is a stand for the iPad (iPhone version available too) that expands on the sound from the speaker through a non-powered horn. To add to the quality look, the wood block and finish on the horn round out the visual impact of the vintage effect.